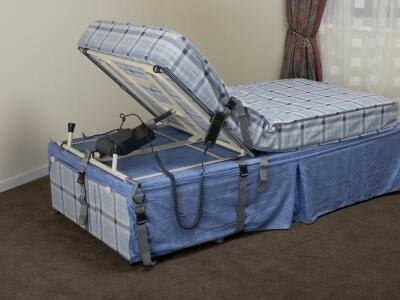 Rise Easy Mattress Elevator, Electric Powered. The Rise Easy Mattress Elevator sits users up in bed at the push of a button and eliminates the need for carers to lift or the person to lift themselves. The Rise Easy Mattress Elevator is easy to install and is an affordable solution to assist with raising and lowering the mattress. 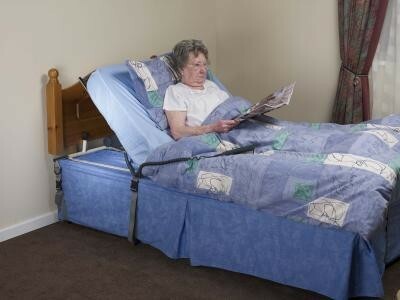 Transferring into and out of bed or sitting up are difficult tasks for individuals and their carers. The movements require a lot of effort and also that the carer leans forward and puts a lot of stress on their back. The frame is secured with support straps and quick release buckles for when it needs to be removed. It is also easy to install, strong and durable as well as suitable for recycling and refurbishment. The frame is also wipe clean with non abrasive cream cleaners. Spare parts are available if required. Not suitable for use with orthopaedic mattresses or slatted beds. Found this product to be excellent value for money and does the job intended, however we did find that the instructions to strap it to the bed were a little difficult to understand. however with no disrespect to yourselves (your information was downstairs, I was upstairs with the instructions) I rang the manufacturer and they very kindly helped me, other than that we have no complaints, and commend you on your speedy response and delivery and will be our first port of call if ever we need anything else.